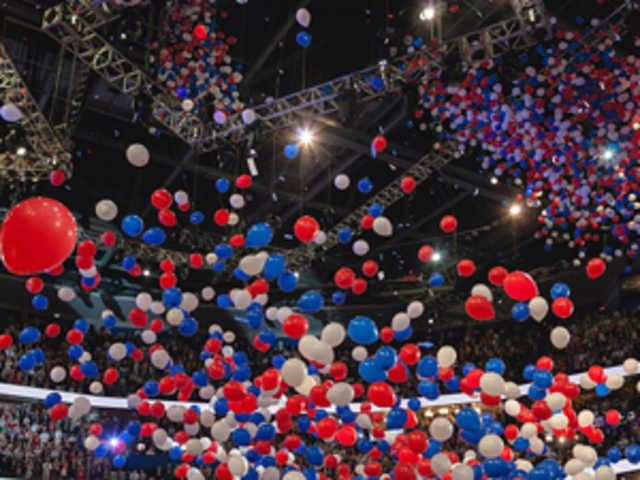 Balloons drop at a Republican National Convention. PLEASE NOTE: This article was published on Tuesday, April 19, the morning of the NY primary. (by Aaron Zitner, The Wall Street Journal) – Voters have gone to the polls in droves during the Republican primaries, putting turnout on a record pace, yet the decision about who will be the ultimate nominee is increasingly likely to rest with fewer than 2,500 party insiders. That has put GOP leaders in a historic and potentially explosive bind: Explaining that while Donald Trump has the most votes—some 1.9 million more than his closest rival—the rules could allow those officials to nominate someone else. Democrats face their own challenges. Hillary Clinton’s commanding lead is built in part on party officials known as superdelegates, rather than raw votes. The squeeze is particularly strong on the Republican side. 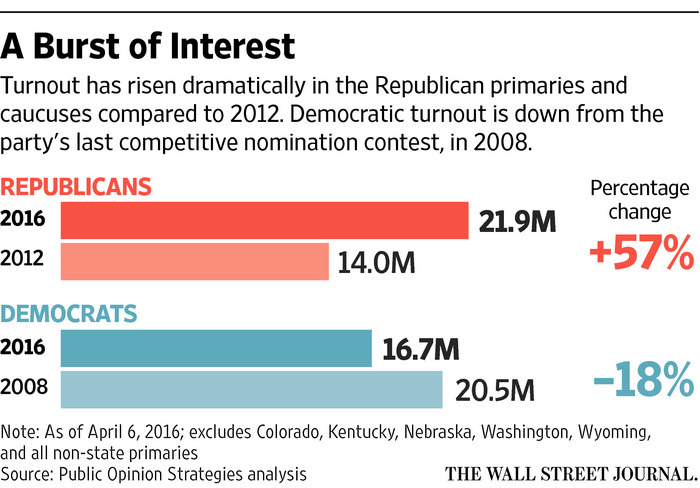 Turnout this year is up 57% over 2012 and viewership for the party’s debates has set records. Voters in two of the most populous states, New York and California, are taking a rare, prominent role in the primary campaign as arbiters [the one who make the deciding vote] of the outcome. But party leaders who have cheered the high turnout are now under fire to explain a process that could deprive Mr. Trump of the nomination, despite his large lead in both delegates and overall votes. [As of Monday, before the NY primary], Mr. Trump was leading the GOP pack with 744 delegates—493 short of the 1,237 needed to clinch the nomination. At this point in the 2012 contest, measured by how many delegates have been allocated, Mitt Romney had won 863 delegates but was already the presumptive nominee. Republican party leaders say that if no candidate wins a majority of delegates during the primaries, the national convention will follow long-established rules for finding a nominee who has majority support. But the fair course, a large majorities of voters say, is to give the nomination to whoever won support from the most voters. Nearly two-thirds of Republicans believe the nomination should go to Mr. Trump if he wins the most primary votes, even if he hasn’t won a majority of delegates, a Wall Street Journal/NBC News poll found this week. Only one-third said the convention should pick whoever the delegates think is best. Other polls have turned up similar results. Adding to the pressure on GOP leaders is Mr. Trump’s increasingly sharp complaints that while his primary victories reflect the will of the voters, the process for selecting convention delegates is “rigged’’ by party insiders who oppose him. “The risk for the Republican Party is that they alienate the very people who are the most motivated to come out and support a Republican nominee,” said Amy Walter, an analyst with the nonpartisan Cook Political Report. Among Democrats, a parallel debate about the balance between primary voters and party insiders has broken out over the role of superdelegates, the party officials and activists who can vote at the convention for whoever they choose. Mrs. Clinton ’s lead over Vermont Sen. Bernie Sanders among superdelegates—estimated at 469 to 31—is far larger than her percentage lead in raw votes. Going into Tuesday’s New York primary, Clinton, the former secretary of state, held an overall 1,758 to 1,076 delegate lead over Mr. Sanders in the Democratic race, with 2,383 delegates needed to win the nomination. Some Democrats say superdelegates should be scrapped so that the process relies only on primary and caucus results. That is the position of Rep. Ron Kind (D., Wis.), a superdelegate himself, who believes the system risks undermining the will of the voters. The nominating rules are under more challenge than at any point since the turbulent 1968 Democratic convention in Chicago, when anti-Vietnam War activists protested that they had been shut out of the nominating process. That triggered changes within both parties that gave voters a larger voice through primaries and caucuses. Parties now hold fewer “beauty contests”—primaries that are only advisory—and more contests that commit convention delegates to back candidates based on the results of primaries and caucuses. Missouri Republicans, for example, held a nonbinding contest in 2012 but a binding primary this year. Turnout nearly tripled as a result. Cable television and social media are also boosting engagement, in part because of Mr. Trump’s unique ability to capture attention. In 2015 alone, Facebook says, some 78 million people commented or clicked on political material on the social network some 1.7 billion times. Polling suggests such opinions are widespread: In the Journal/NBC News poll, a large share of GOP voters who didn’t name Mr. Trump as their top choice for president nonetheless said the candidate with the most votes should be the nominee. Those opinions could add fuel to Mr. Trump’s complaint that the delegate selection process has been unfair in states such as Colorado, where party officials opted not to hold a caucus or primary to [allow people to vote, rather held] a state convention to chose Cruz supporters as delegates to the nation convention. Mr. Trump has also complained that while he won the primary in Louisiana, Mr. Cruz may end up with the larger share of delegates. A standoff with Mr. Trump could not only cause a rift within the party but change the nominating process for future elections. Published on April 19. Copyright 2016 Dow Jones & Company, Inc. All Rights Reserved. Reprinted here for educational purposes only. May not be reproduced on other websites without permission from The Wall Street Journal. Visit the website at wsj .com. 1. What problem do both Republican and Democratic leaders face regarding their parties’ nominees? 2. GOP stands for “Grand Old Party” – the nickname for the Republican party. How do you think GOP party leaders (as well as Democratic party leaders) could/should solve the problem? 3. How is it possible that a different candidate could be nominated as the Republican party’s nominee if Donald Trump wins the majority of votes? 4. How have the number of Democratic and Republican voters changed from the 2008 and 2012 primaries? 5. a) From para. 9: “Republican party leaders say that if no candidate wins a majority of delegates during the primaries, the national convention will follow long-established rules for finding a nominee who has majority support.” How do Republican voters differ from this position? Be specific. b) What do you think about your party’s position on the primary/nomination process? (Agree, disagree) Explain your answer. 6. Why specifically are Democrat Bernie Sanders’ supporters angered at the nominating process for their party? a) Do you agree or disagree? Explain your answer. a) Would this be a bad thing for the election process or a good thing? Explain your answer. CHALLENGE: How many delegates does the candidate from each party need to win to secure his/her party’s nomination? How many does each currently have? …Some say the delegate process creates a role for people who care about the party’s long-term health, its political philosophy and the electability of its nominee in November. “The role of the party is to try to figure out what the grass-roots wants, but then lay over it some amount of pragmatism and caution and tradition…with electability as one part of pragmatism,” said Stuart Rothenberg, a nonpartisan political analyst. Still, the combination of higher voter engagement and an inconclusive result could prove damaging to the GOP. It has already led to the unusual spectacle of the party’s front-runner feuding with its national chairman over the nominating rules.